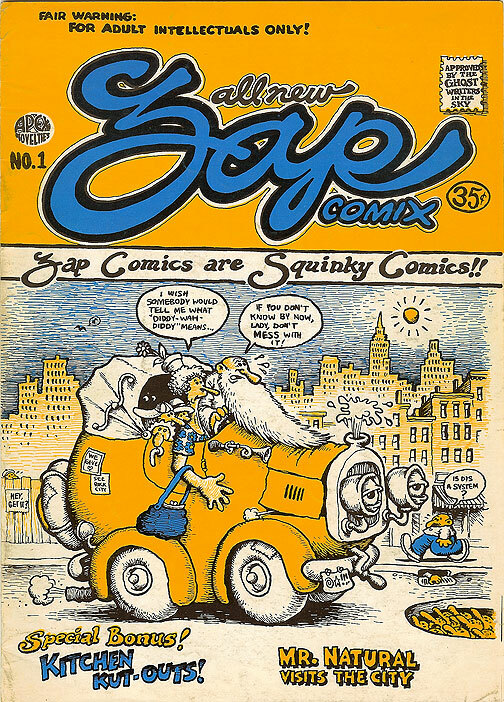 Zap #1, Robert Crumb's hugely influential comic book. At nearly the same time as Crumb was peddling Zap #1, another odd duck was founding what would soon prove to be the focal point for the San Francisco comix scene. Gary Arlington was a local-born outsider whose inability to come up with any clear-cut career path led him to start the San Francisco Comic Book Company, one of the world’s first comic book stores, wedged into a tiny storefront on 23rd Street near Mission, in the City’s low-rent, mainly-Latino, Mission District. 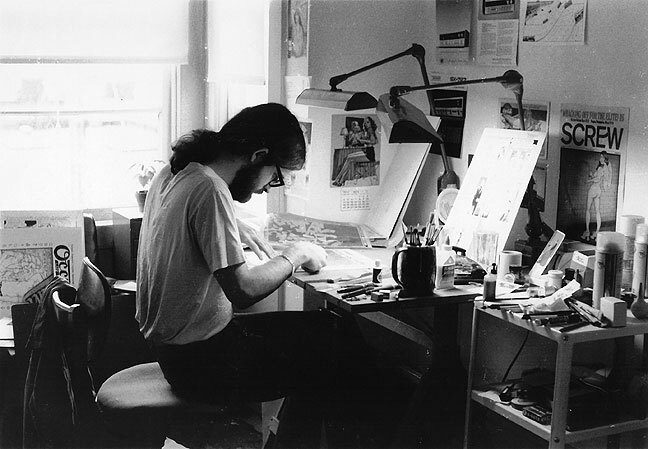 John Thompson, one of the growing ranks of comix artists, takes credit for discovering Arlington’s shop and turning on other cartoonists to the store. Jay Kinney at work in winter ’72-’73 on 20th St. near Valencia, laying down zipatone shading film on a story destined for Occult Laff-Parade #1. In common with many of the underground cartoonists, Arlington had been a big fan of EC Comics, the small New York comics publisher who had published, arguably, the highest-quality horror, science-fiction, war, and humor comics of the early ’50s. EC had nearly been driven out of business when the comic book field was subjected to congressional hearings concerned about comics possibly corrupting young readers. A whole generation of EC fans was traumatized by the demise of their favorite titles (only Mad survived the debacle, and only by switching to magazine format). The shared myth of EC’s martyrdom fueled Arlington’s hospitality for the underground artists stopping by his shop. Aided by certain psychoactive enhancements, Arlington was soon seized with the vision of the fledgling underground comix movement comprising a latter-day rebirth of EC. With the further discovery of Jehovah’s Witness pamphlets, Arlington would shortly discover his true calling as the second coming of Christ—a peculiarly comic book-oriented Jesus, to be sure—but the underground artists took this in stride, gently poking fun in numerous cartoons at their comic messiah. When they had their fill of time at the drawing board, the cartoonists would wander by the shop and shoot the breeze with Gary and whoever else showed up. Surrounded by a mix of golden age comics pinned to the walls in stiff plastic sleeves and expanding racks of the new underground comix, the underground artists could develop a sense of their movement as situated within a comics continuum extending back decades. New possibilities were still in the air, courtesy of a countercultural milieu that seemed to have embraced the upsurge of comix, allowing artists to propel themselves in new directions, discovering new taboos to violate or new envelopes to push. 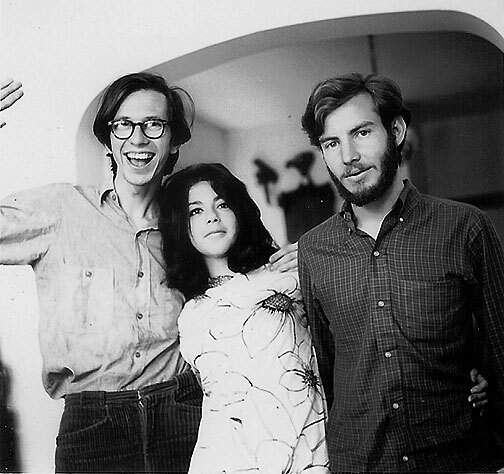 Robert Crumb with Jane and Jay Lynch, at their flat in Chicago, Sept. 1968. Instrumental to this sense of artistic urgency was the constant interplay among the cartoonists, where a good-natured sense of competition led many artists to continually try to top each other’s best work. Feedback from one’s readers was relatively rare, but for artists living in close proximity, a ten-minute walk with a latest comic strip in hand could elicit praise or artistic advice from one’s fellow artists. 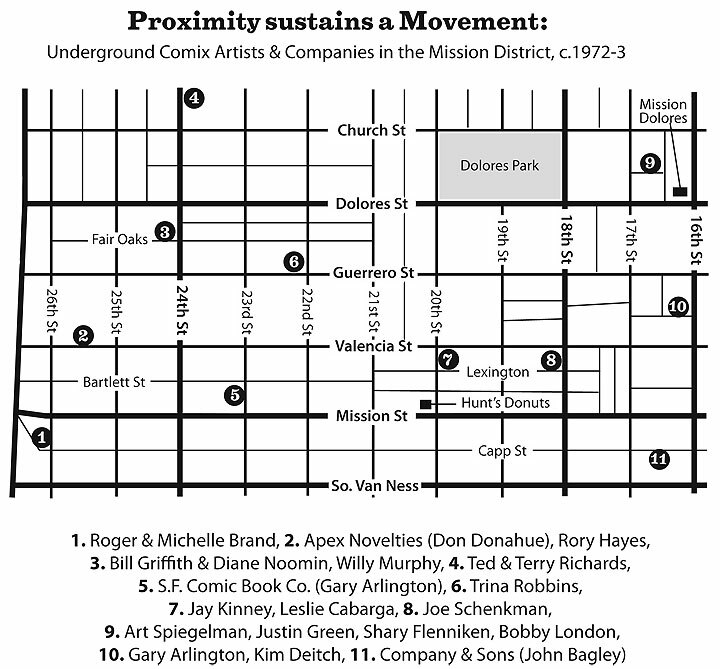 At the peak of the underground comix movement—roughly 1972-1973—the Mission District was peppered with cartoonists all living within walking distance of each other. Few of the artists involved were San Francisco natives. As with the upsurge of the Beats in North Beach in the ’50s, and with the much-hyped love generation in the Haight-Ashbury around 1966, the influx of cartoonists attracted to the underground scene in the Mission pulled in participants from far and wide. by Jay Kinney, from his essay "The Rise and Fall of Underground Comix in San Francisco and Beyond, in the anthology "Ten Years That Shook the City: San Francisco 1968-78" (City Lights Foundation: 2011), edited by Chris Carlsson.